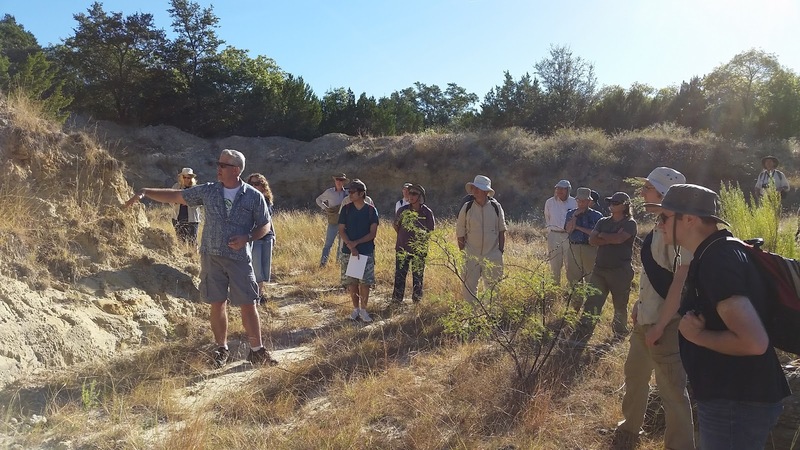 While the morning was still cool, we ventured out to the Jones Ranch quarry, where the remains of several Sauroposeidon were excavated. Originally called Paluxysaurus, these bones belonged to several large sauropods from the Twin Mountains Formation, which is about 113 million years old or so. I was pretty impressed by the size of the quarry – I’m standing maybe 5 feet in front of one of the quarry walls, and looking towards the other. 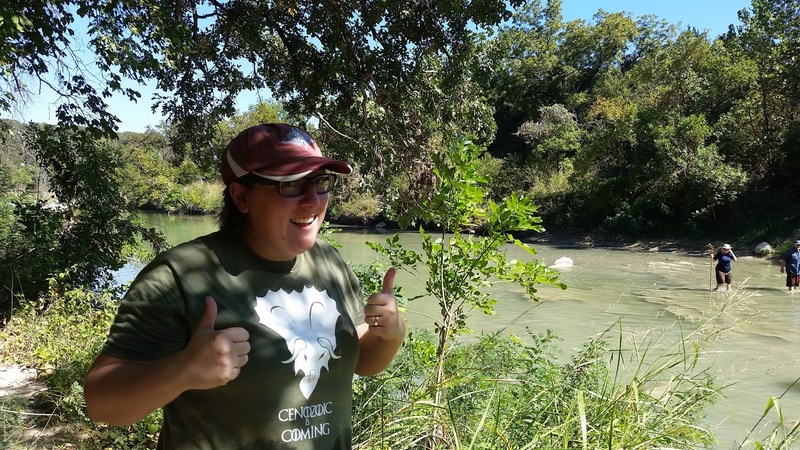 Second stop – Dinosaur Valley State Park and the Paluxy River/Glen Rose trackways! 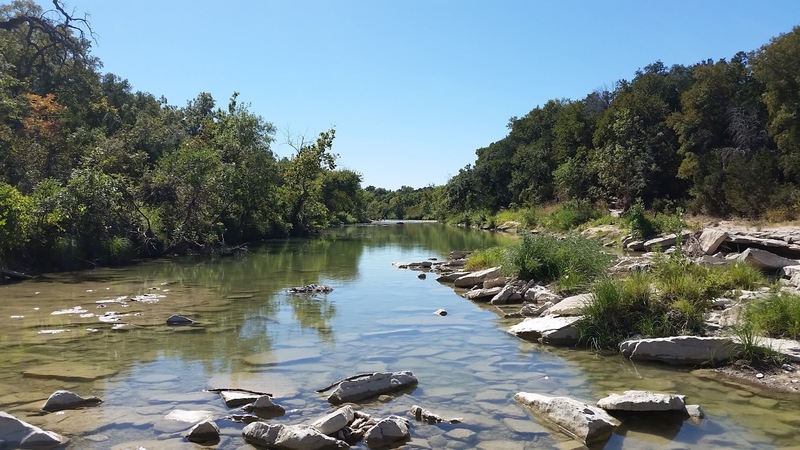 Dinosaur Valley State Park is one of those iconic dinosaur places that I’m sure is on many palaeontologist’s bucket lists. If you’ve visited the American Museum of Natural History, you will probably have seen some of the trackways cut out of this very river – a piece of the tracksite was taken back to New York for display and hangs out underneath the Apatosaurus (Brontosaurus? Now I forget which specimens are which!). The trackways are in the Albian aged Glen Rose Formation, and the rocks represent a lagoon or shallow marine environment. I guess dinosaurs liked the occasional day at the beach, as well! There are two kinds of trackmakers here, and here’s one of them – a large theropod, probably something like Acrocanthosaurus. And here’s the other trackmaker, a large sauropod, possibly something like Sauroposeidon. 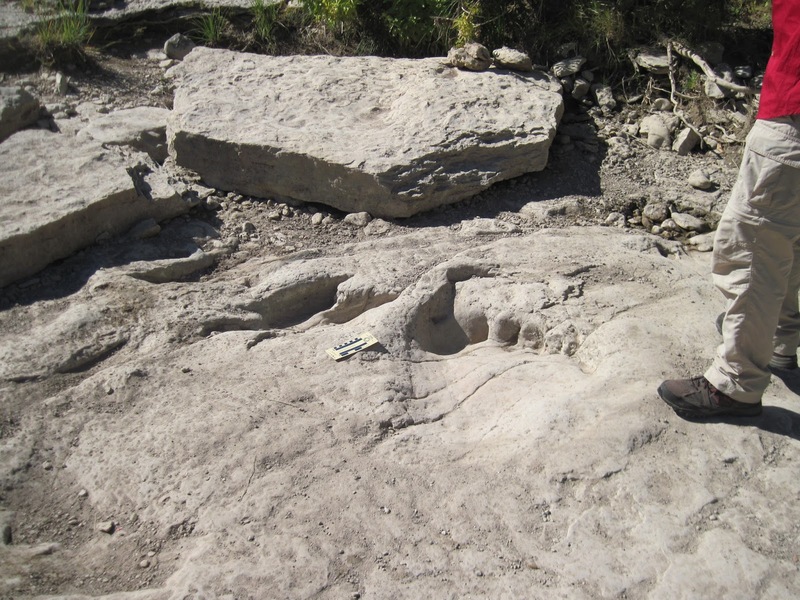 In case that one is hard to make out, the hind foot print is about a foot to the left of that person’s shoe, and is the large smooth depression with a series of vertical shadows at the front – those are the claw marks from a sauropod’s hind foot. 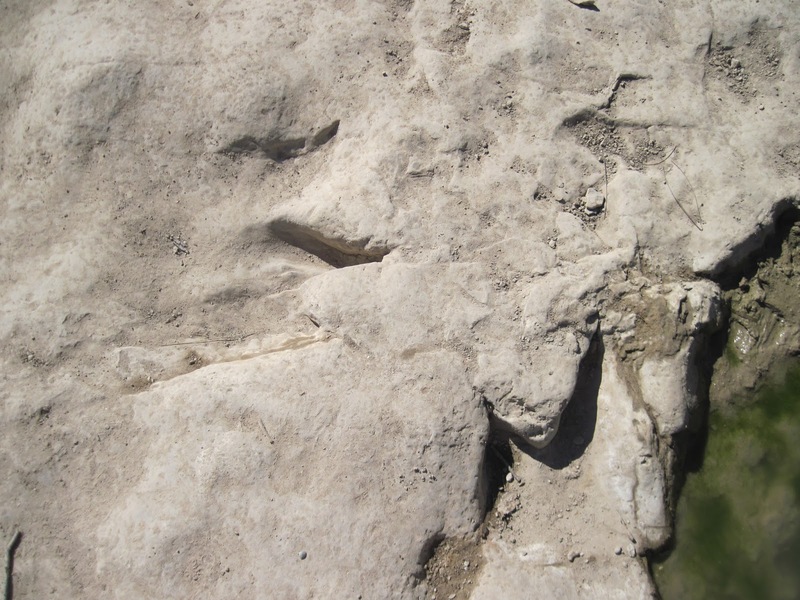 The front feet made totally different tracks, which look kind of like crescents or half-moons. Intrepid field trip leader James Farlow heads into the river to sweep of a larger track surface. 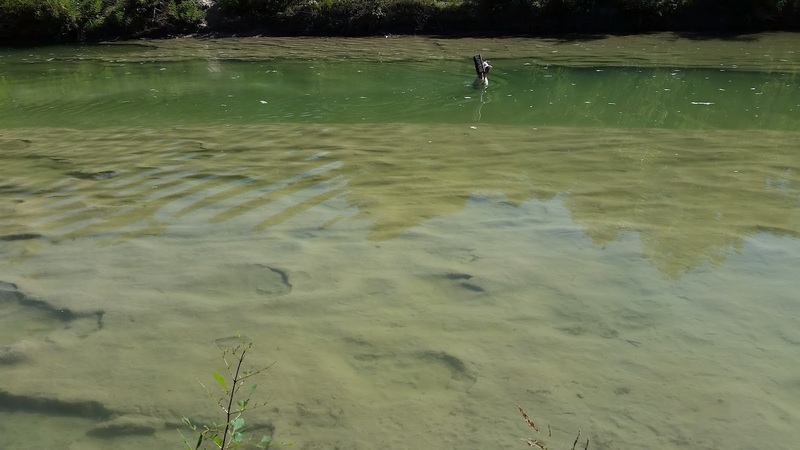 Most of the trackways are submerged, and you can see some of them in the foreground in this picture – look for the alternating big teardrop or circle shapes! Most of us waded in and took turns sweeping slime out of the footprints and standing in them. The cool water felt pretty good on a hot Texas afternoon! 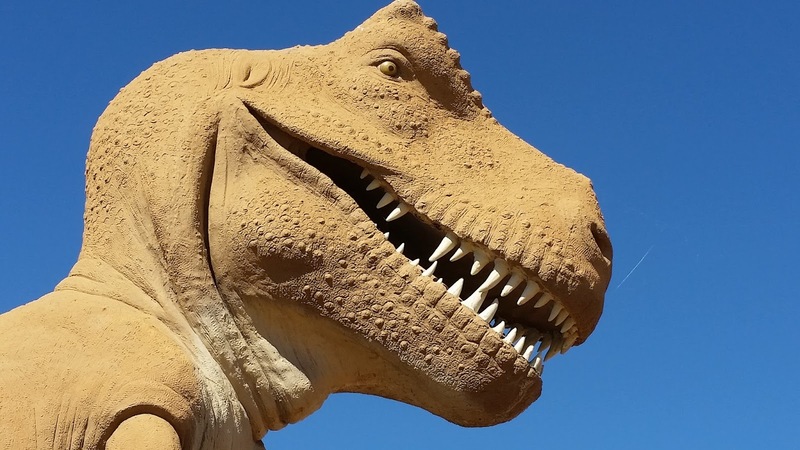 And this post wouldn’t be complete without mentioning the great opportunity to see a different era of palaeontological history, in the form of original Sinclair World’s Fair dinosaur statues! 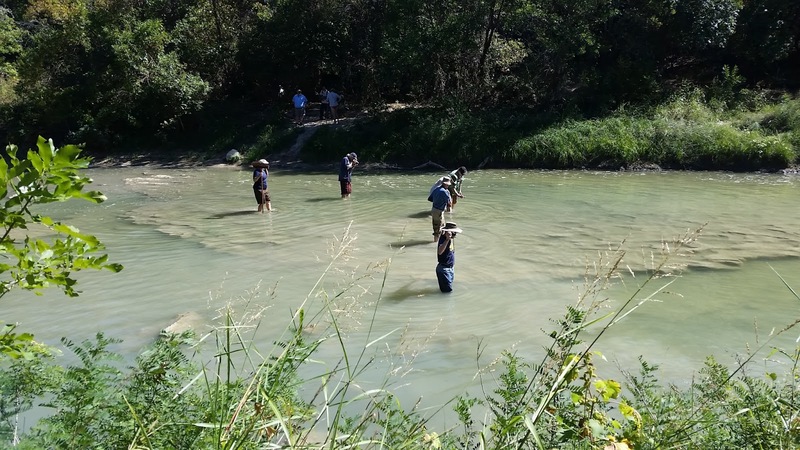 The Arlington Archosaur Site is a huge quarry in the Cenomanian Woodbine Formation that is located in an active housing development site – pretty soon, this will be part of some lucky people’s backyards! It’s a neat parallel to the Danek Bonebed in Edmonton, which is also located right within the city. Many volunteers have contributed thousands of hours to help excavate the remains of crocodilians, the early hadrosaur Protohadros, and more. This site has only been worked for a few years, so expect lots of discoveries and publications to come. Find some ankylosaurs, guys! 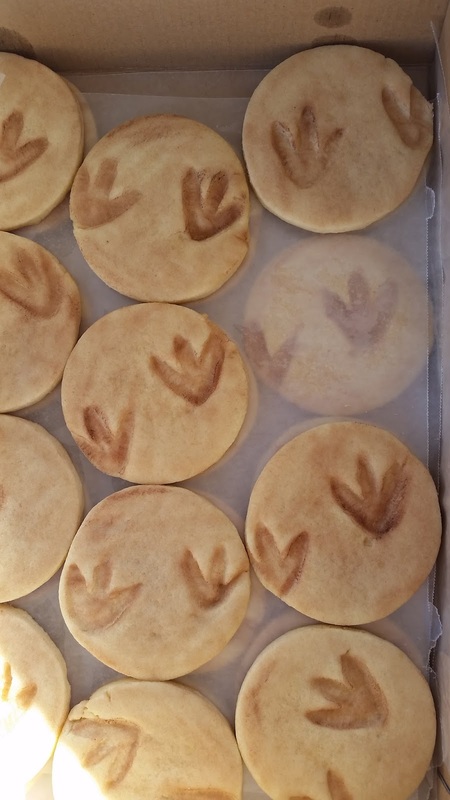 The AAS volunteers had cold beverages and dinosaur trackway cookies waiting for us! Y’all are too nice. What a great way to end the day. 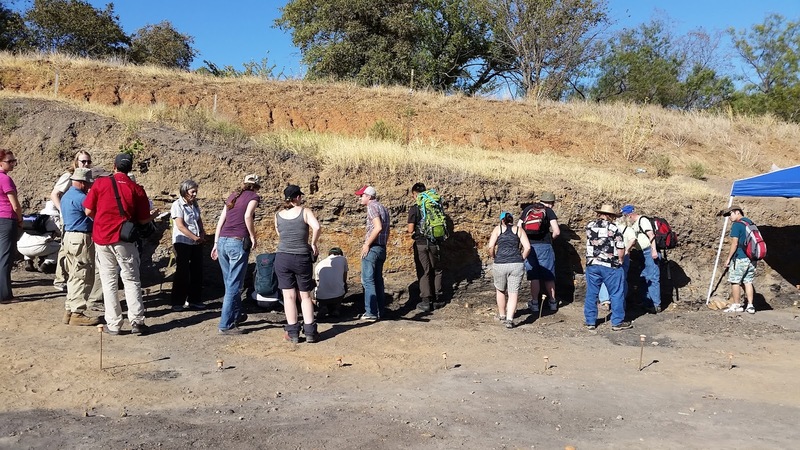 Many many thanks to the field trip leaders Chris Noto, Thomas Adams, and James Farlow for taking us on this romp through the mid Cretaceous – it was a great mix of classic sites and new discoveries, and a great start to the conference! ← Mad-packed with all nine essential nutrimites to fortify your X-Zone!